Jackson called the accusations against him — which included improperly doling out drugs and being drunk on the job — "completely false and fabricated." 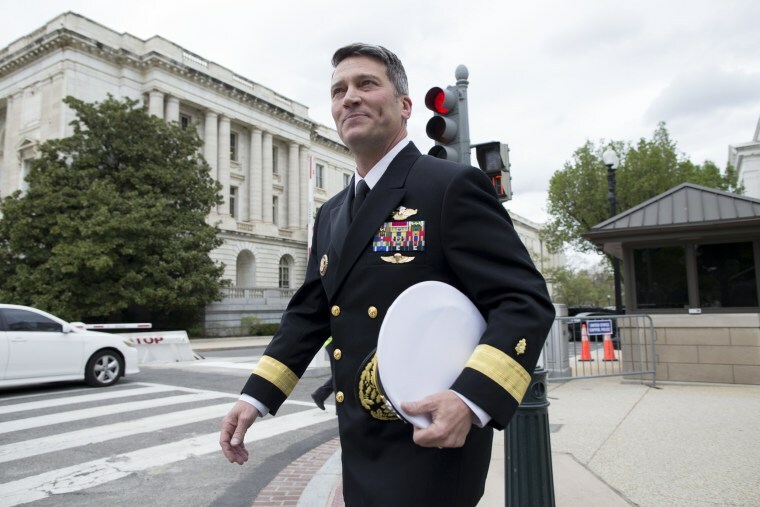 Dr. Ronny Jackson, the White House physician tapped by President Donald Trump to head the troubled Department of Veterans Affairs, withdrew his nomination on Thursday amid a flurry of allegations against him, including being drunk on the job and improperly doling out prescription drugs. Jackson called the accusations against him "completely false and fabricated." "Unfortunately, because of how Washington works, these false allegations have become a distraction for this president and the important issue we must be addressing — how we give the best care to our nation's heroes," he said. Jackson, the White House physician who shared the results of Trump's annual physical with the press earlier this year, had faced growing allegations of misconduct, including improperly handing out prescription drugs, being intoxicated on the job and creating a toxic work environment. Trump called into Fox News on Thursday shortly after the nomination was withdrawn to rip Jackson's critics. "He would have done a great job," the president said. "Tremendous heart. These are all false accusations. They're trying to destroy a man. By the way, I did say, 'Welcome to Washington. Welcome to the swamp.'" Trump said he had someone else in mind for the job but declined to disclose the name. Later, at a White House event honoring the Wounded Warriors Project, Trump offered enthusiastic praise for Acting VA Secretary Robert Wilkie, who, the president said, is "doing a great job at the VA."
Trump also slammed Sen. Jon Tester, D-Mont., the ranking member of the Senate Veterans Affairs Committee, with going public this week with some of the allegations against Jackson. "I think Jon Tester has a big price to pay in Montana," Trump said on Fox. Jackson's confirmation hearing had been scheduled for Wednesday, but was postponed amid concerns over the allegations of inappropriate behavior. He is at least Trump's 24th unsuccessful nominee to a post that requires Senate confirmation, according to an NBC News tally. On Wednesday, congressional Democrats released details of allegations of improper conduct involving Jackson after interviewing nearly two dozen current and former colleagues of his — most of whom the committee said are still in uniform. The Democrats said those interviewed "raised serious concerns about Jackson's temperament and ethics, and cast doubt on his ability to lead the second-largest agency in government." According to a two-page summary of the interviews released by the panel's staff, the White House medical unit had "questionable record keeping" for the medications it was distributing under Jackson's leadership. On one occasion, Jackson was said to have provided a "large supply" of the opioid drug Percocet to a staffer for the White House Military Office, which threw the office "into a panic" because it didn't know where the drugs had gone. In addition to concerns about his prescribing practices, the summary noted "multiple incidents of drunkenness on duty," including one instance when Jackson could not be reached when he was needed "because he was passed out drunk in his hotel room." Another accusation was that Jackson once got drunk at a Secret Service going-away party and "wrecked a government vehicle." It did not note the year of the alleged incident. The summary of interviews released Wednesday also included allegations from multiple people who said Jackson was known as the "candy man" among White House staff because they said he would provide prescription drugs without paperwork. Jackson also engaged in a pattern of handing out Ambien to help people go to sleep on Air Force One and distributing Provigil to help people wake up, says the summary, which added that he did not triage patients' medical history when giving those drugs out. Tester, for his part, issued a statement Thursday thanking the servicemembers who came forward with the allegations and said he was urging Congress to continue its investigation into the White House Medical Unit. The White House had stood by Jackson as recently as Wednesday, with multiple top Trump aides expressing their support for him publicly — even after Trump had opened the door for him to withdraw his nomination. Jackson, meanwhile, was back at work at the White House on Thursday, despite his withdrawal. “Admiral Jackson is a doctor in the United States Navy assigned to the White House and is here at work today," White House Press Secretary Sarah Huckabee Sanders said.